This content is reposted with permission from the website at the Longmore Institute at San Francisco State University. Protesters gather at UN Plaza outside federal building in San Francisco on April 5, 1977. 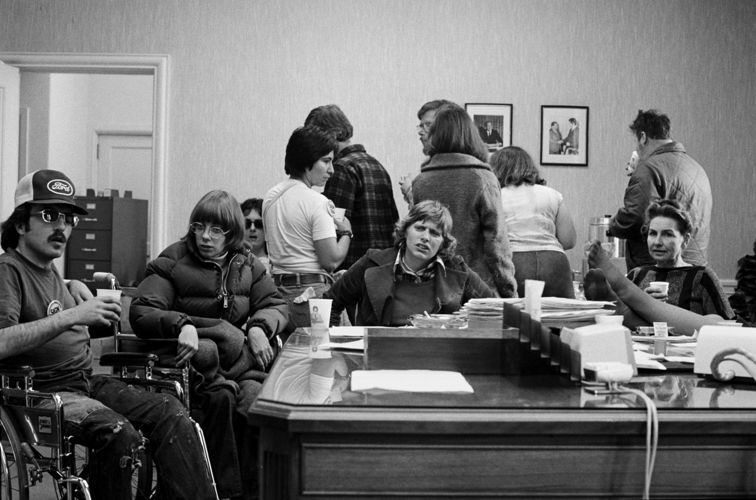 This is the story of a remarkable, overlooked moment in U.S. history when people with disabilities occupied a government building to demand their rights. 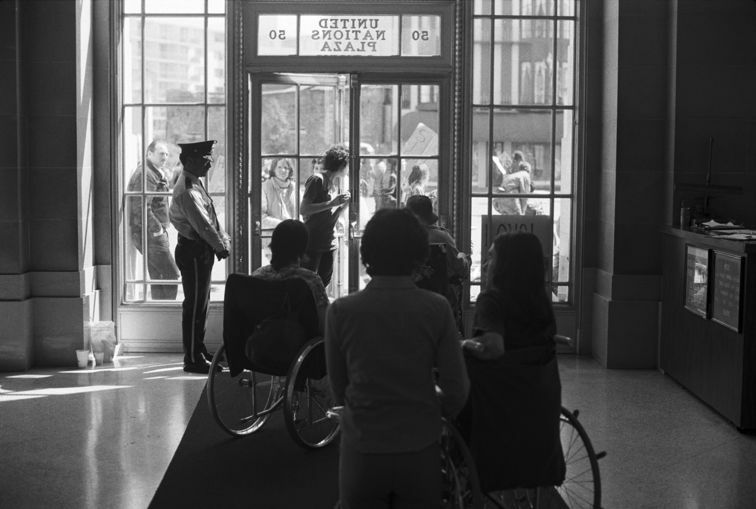 Known as the “Section 504 Sit-In,” the protest profoundly changed the lives of people with and without disabilities, and paved the way for the Americans with Disabilities Act (ADA) in 1990. 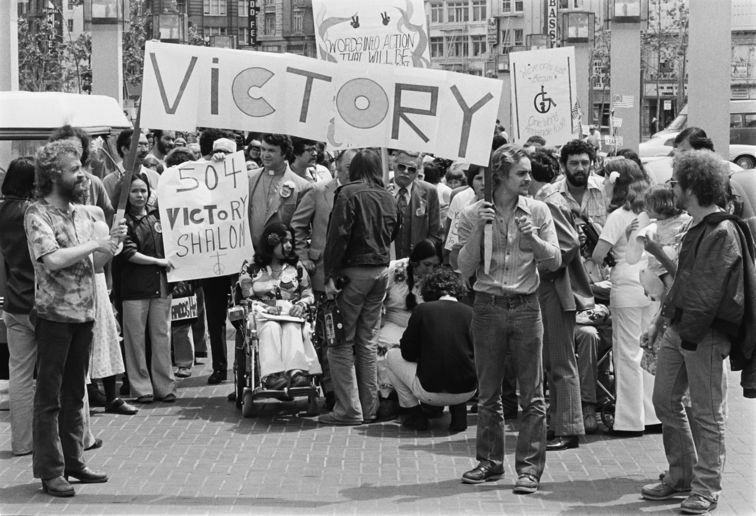 On April 5, 1977, American people with and without disabilities showed the world the power of grassroots activism. In San Francisco, more than 100 people began a twenty-six day occupation of the Federal Building to insist on getting civil rights. 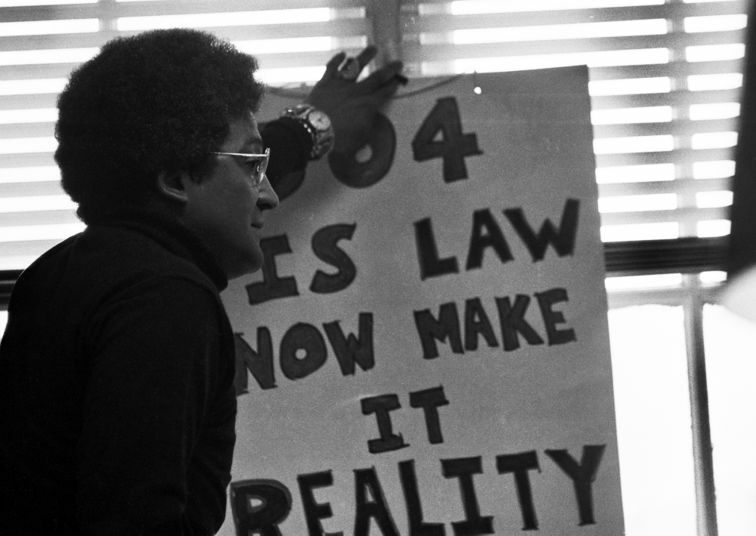 Four years earlier, Section 504 of the Rehabilitation Act of 1973 had made it illegal for any federally funded facilities or programs to discriminate against disabled people. One signature from the Head of Health Education and Welfare (HEW) stood in the way of the law taking effect. People waited and waited. At last in 1977 frustration turned into bold action. A diverse coalition launched protests across the country. San Francisco's occupation was the most significant. On April 30, 1977, San Francisco's Section 504 occupiers emerged victorious from the longest take-over of a federal building in US history. A national disability rights movement was born. This pivotal moment led to the Americans with Disabilities Act (ADA) signed twenty-five years ago on July 26, 1990. In the lobby of the Federal Building at UN Plaza. Occupiers and their supporters in San Francisco’s Civic Center Plaza celebrate the signing of the Section 504 regulations. On April 28, 1977, Joseph Califano, Secretary of Health, Education, and Welfare (HEW), signed the Section 504 regulations. Protesters in San Francisco stayed for two more days to clean up and say good-byes. Everyone was energized by this huge accomplishment; there would be no turning back. 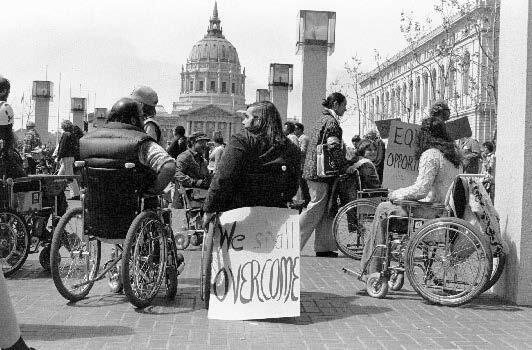 The San Francisco occupiers came from the entire Bay Area, which had attracted many people with disabilities. In fact, Berkeley’s disabled population increased from an estimated 400 in 1972 to 5,000 in 1976. Why? • The growing Independent Living Movement employed people with disabilities, fostered disability pride, and gave advice for living in the community. • California had a personal care attendant allowance. • Good weather and more curb cuts on sidewalks than any other city made it easy to get around. • Like other immigrants, disabled newcomers found support from people who had already paved the way. • Everyone who wanted change could find social movements with like-minded people. 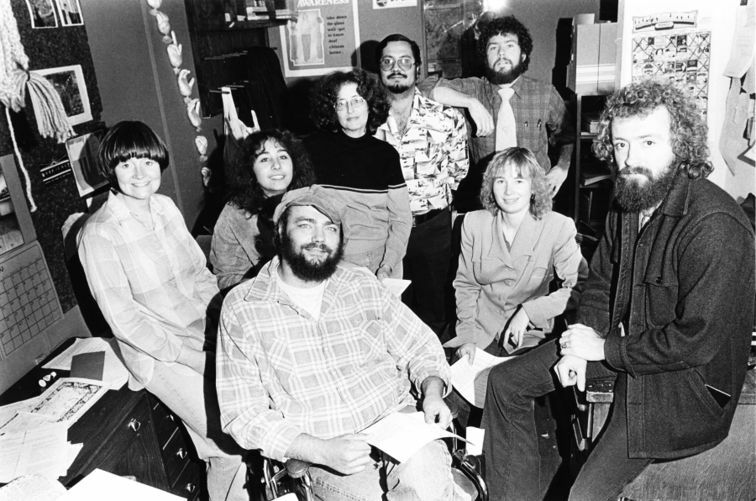 Berkeley's Center for Independent Living (CIL) attracted many people with disabilities. Everyone in this group photo participated in the Section 504 occupation. When the sit-in began, nobody dreamed they'd be there for nearly a month. Most arrived with nothing. Some risked losing jobs and relationships. For many, this was the first time they had slept away from home. Despite hardships, they also found camaraderie as they talked, played cards, sang, partied, made friends, and fell in love. • Even people who were there cannot agree on how long the sit-in lasted and how many occupiers were in the building. • The key role of lesbians and radical organizations like the Black Panther Party is only now beginning to emerge. • Women wheelchair riders led the San Francisco 504 Protest. • Many disabled people thought the San Francisco protesters were too radical and believed it was wiser to work within the system rather than against it. • Some occupiers got past the Federal security guards with relative ease; a few even snuck off for showers or to the beach. • Deaf people participated in the sit-in but the Deaf community has mixed feelings about the Section 504 regulations because mainstreaming in education threatens Deaf language and culture. Without Section 504 of the 1973 Rehabilitation Act, there would be no Americans with Disabilities Act (ADA). The 1973 Act served as a template for the more comprehensive law passed in 1990. 504 gave ADA advocates evidence that disability rights could benefit many without adding a huge burden on society. • Because 504 defined disability flexibly and took prejudice into account, the ADA could be about civil rights rather than medical diagnoses. • By building in ideas such as “reasonable accommodation” and “avoiding undue hardship,” Section 504 ensured that the ADA would always be about compromise. • After the long wait to have Section 504 signed, those who wrote the ADA made sure that it had to be signed into law within one year. • Section 504 and the battle to have it signed forged a generation of disability activists who would help draft and pass the ADA. • Because the Section 504 protests and legislation grouped people with many different disabilities together, there would be one big ADA instead of mini-ADAs for each impairment group. • The Section 504 protest lit the spark for a national disability rights movement and national disability organizations that could promote and defend the ADA.